An eggshell is the outer covering of a hard-shelled egg and of some form of eggs with soft outer coats. It contain the ideal substance for healing cavities [which regular toothpaste do not], and large amounts of calcium and 27 minerals. 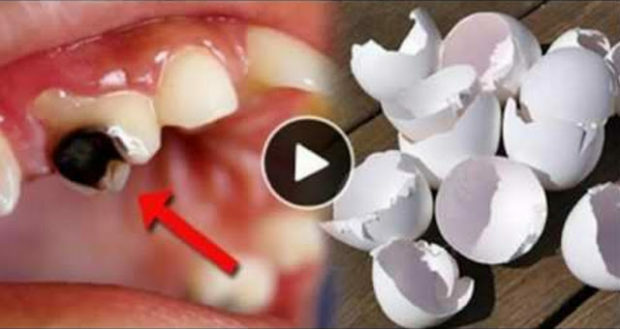 The composition of eggshells, resembles human teeth. It provides the important amount of calcium to re-mineralize teeth. A Hungarian physician, Krompeher, conducted a research along with the medics and biologist. They studied the healthy properties of the eggshells. Over 10 years of study have shown that eggshells are a good source of bio-available calcium [dense and easily absorbed]. Also a research conducted by a dentistry school in the Philippines, comparing various commercial toothpaste brands with their own compounded toothpaste from eggshells. They concluded that overtime, the teeth cleaned with the eggshell toothpaste had less plaque build-up and contains stronger enamel. This is due to eggshells have calcium and other trace minerals, which are essential for a healthy enamel, thus preventing cavities. Take the eggshells and put them in boiling water for at least 5 minutes to get rid of the pathogens. Then air dry them. Grind up the shells in a coffee grinder until they turn into a fine powder. Take ½ teaspoon every day. You can add it to your food. Bone tissue is composed of calcium – The bones and teeth of human are similar to the composition of eggshells. The calcium content [93%] in the eggshells is one of its benefits. It also used for treating such orthopedic diseases as congenital dislocation of a hip or osteoporosis. Eggshells also contain mineral elements such as phosphorous, sodium, iron, silicon, magnesium, aluminum, potassium and sulfur. Eggshell contain 27 elements – The protein of eggshells are composed of important amino acids like methionine, lysine, isoleucine and cysteine. Properly prepared eggshells are the most balanced natural source of calcium.